The fastest selling book of this very Year, 2018. 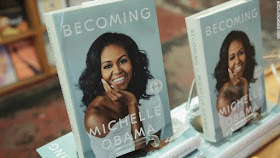 Former first Lady of the united states of America have Made a New record after her NEW book was confirmed the highest selling book 2018 by Crown publishing GROUP, the book was Said to be sold to over 725,000 people in a Day. The sales figure includes hardcover, audio and e-books editions for the United States and Canada, but the book is available in 24 languages around the world – including Vietnamese, Korean, Japanese and Hebrew! The Black first Lady has broken a record – already surpassing the first day sales of other memoirs also written by first ladies. For example, Hillary Clinton’s Living History, which was released in 2003, sold only around 600,000 copies in it’s first week! As it was written the story becoming, a work of deep reflection and mesmerizing storytelling, she invites readers into her world, chronicling the experiences that have shaped her – from her childhood on the South Side of Chicago to her years as an executive balancing the demands of motherhood and work, to her time spent at the world’s most famous address.